ESTES PARK, Colo. – Dustin Egusquiza and Clint Summers needed a bit of a break after a stretch of back luck on the rodeo trail. Dustin Egusquiza shows off his championship spurs. They got it in this picturesque town in the Colorado Rockies, taking a few days away from the arena to enjoy the cool weather and activities around this community of about 6,000 people who host 4 million visitors every year. They capitalized on it Monday night by winning the team roping title at Rooftop Rodeo, stopping the clock in 4.1 seconds to claim the championship and $4,204 each. Not bad for a couple of Florida cowboys that just started roping together in the last couple of months. 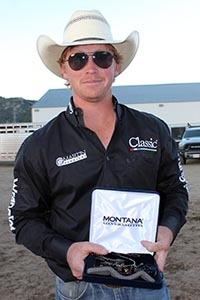 Clint Summers has competed at Rooftop Rodeo for several years and finally won the spurs. Both young cowboys see the partnership as a grand opportunity. Both are young: Summers is 24, and Egusquiza is 20. Now they’re trying to take the next steps in their rodeo careers together. The competitive tandem has made the most of their time in the resort town by enjoying daily battles of miniature golf. They hope to spend a few more days in Estes Park before heading to their next rodeo. “It’s my first year coming here,” Egusquiza said. “I’ve loved it ever since we got here two days ago. It’s an awesome place. There are a number of reasons, and a packed house every night is a good reason. But there’s much more to Estes Park’s rodeo than is on the surface. From the good prize money to the championship trophy spurs, there are plenty of incentives for rodeo’s greatest stars. Steer wrestling: First round: 1. Wade Sumpter, 3.8 seconds, $1,597; 2. K.C. Jones, 4.4, $1,321; 3. Cody Cabral, 4.6, $1,046; 4. (tie) Dakota Eldridge, Billy Bugenig and Josh Peek, 4.87, $514. Second round: 1. Rowdy Parrott, 3.9 seconds, $1,597; 2. Cole Fulton, 4.0, $1,321; 3. (tie) Jarret New and Brian Snell, 4.1, $908 each; 5. (tie) Josh Peek and John Franzen, 4.2, $385 each. Average: 1. Josh Peek, 9.0 seconds on two runs, $2,395; 2. Dakota Eldridge, 9.1, $1,982; 3. Rowdy Parrott, $1,569; 4. Jarret New, 10.3, $1,156; 5. Cole Dorenkamp, 10.5, $743; 6. Jacob Shofner, 10.7, $413. Team roping: 1. Dustin Egusquizaq/Clint Summers, 4.1 seconds, $4,204; 2. Luke Brown/Jake Long, 4.4, $3,761; 3. (tie) Cody Snow/Dugan Kelly and Colby Lovell/Travis Graves, 4.5, $3,098 each; 5. Adam Rose/Walt Woodard, 4.6, $2,434; 6. Clay Smith/Paul Eaves, 4.8, $1,991; 7. Aaron Tsinigine/Kinney Harrell, 4.9, $1,549; 8. Aaron Macy/Bret Tonozzi, 5.1, $1,106; 8. (tie) Kolton Schmidt/Shay Carroll and Billy Bob Brown/Garrett Jess, 5.3, $443 each. Saddle bronc riding 1. Hardy Braden, 84 points on Cervi Rodeo’s Hell’s Fire Hostage, $5,499; 2. CoBurn Bradshaw, 82, $4,216; 3. (tie) Jesse Bail and Blaze Cress, 81, $2,566 each; 5. Jacobs Crawley, 80.5, $1,283; 6. (tie) Landon Mecham and Cole Elshere, 80, $825; 8. Tyler Corrington, 79.5, $550. Tie-down roping: 1. 2. Ike Fontenot, 8.3 seconds, $2,733; 2. (tie) Seth Hall and Ross Tucker, 8.6, $2,301 each; 4. Cory Solomon, 8.7, $1,870; 5. Joseph Parsons, 8.8, $1,582; 6. (tie) Josh Peek and Joe Colletti, 8.9, $1,151 each; 8. Rhen Richard, 9.0 $719; 9. Marshall Leonard, 9.1, $431; 10. (tie) Cody Quaney and Clint Nyegaard, 9.3, $72 each. Barrel racing: 1. Katie Carroll, 17.51 seconds, $4,042; 2. Sherry Cervi, 17.69, $3,234; 3. Trula Churchill, 17.78, $2,627; 4. Heather Ratterree, 17.81, $2,021; 5. McKinley Goodger, 17.85, $1,617; 6. Kathy Grimes, 17.87, $1,213; 7. Kelly Kennedy-Joseph, 17.89, $1,011; 8. Brenda McMahan, 17.91, $909; 9. Lorie Manning, 17.94, $808; 10. (tie) Sabra O’Quinn and Stevi Hillman, 17.95, $657; 12. Taylor Langdon, 17.99, $505; 13. Kayla Jones, 18.00, $404; 14. Tori Morris, 18.03, $303; 15. (tie) Katelyn McLeod and Ari-Anna Flynn, 18.06, $101. Bull riding: 1. 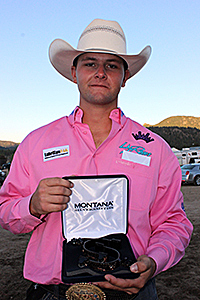 Kurtis Turner, 84.5 on Cervi Rodeos Rank Frank, $4,672; 2. Josh Frost, 83.5, $3,582; 3. Garrett Smith, 82, $2,647; 4. Tyler Smith, 80, $1,713; 5. (tie) Derek Kolbaba and Jeremy Richard Hanson, 79, $934 each; 7. Dustin Muncy, 78, $623; 4. Ardie Maier, 75.5, $467.